I always thought that if I wanted to make my own homemade jam I’d have to learn the process of canning. It seemed like more time and effort than I wanted to put in – I just wanted the jam. So when it came to my attention that there was a “quick and easy” method to jam-making that didn’t involve canning I wasted no time purchasing my fruit. One distinct difference between the quick method and the traditional cooked approach is the flavor. With the quick method the fruit goes in fresh, rather than being cooked, so the end result tastes much more like really sweet fresh strawberries. I actually found this to be rather appealing – and it tasted absolutely wonderful on rich, buttery brioche toast. 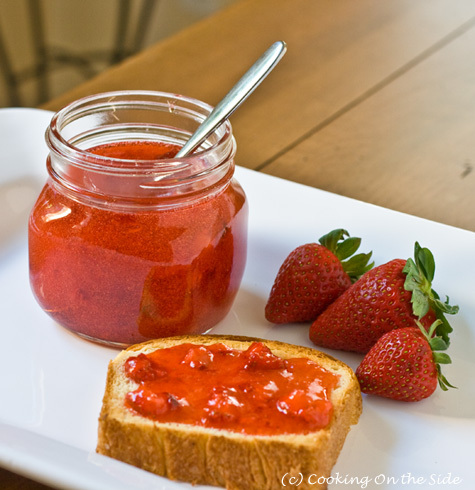 Of course, another key difference is how you store it – the quick jam needs to be kept in the fridge or freezer while cooked jams are shelf-stable up to a year. If I ever decide to give jars of jam as gifts I’ll probably plunk down and learn how to can. But as long as the treat is just for my household, this quick method works great for me. Wash and rinse plastic containers with tight fitting lids. Use 1 to 2 cup size containers (I used some BPA-free Ziploc Twist ‘n Loc containers from the grocery store – I poured the final product into glass jars just for the photos). Discard stems and crush strawberries (recommend using a potato masher). Measure exactly 2 cups crushed strawberries into a large bowl. Add sugar and mix well (do not reduce the amount of sugar or use sugar substitutes or jam may not set properly). Let stand 10 minutes; stir occasionally. Stir pectin and water in a small saucepan (pectin may start out lumpy). Bring to boil on high heat, stirring constantly. Boil 1 minute, stirring occasionally. Remove from heat. Pour into prepared containers, leaving ½ inch at top for expansion during freezing; cover. Let stand at room temperature 24 hours until set. Refrigerate up to 3 weeks. Otherwise, store in freezer up to a year. Thaw in refrigerator. Im glad this recipe met your own personal standards in canning! It looks so good! .-= Jen @ MaplenCornbread´s last blog ..Chocolate Soufflé =-. 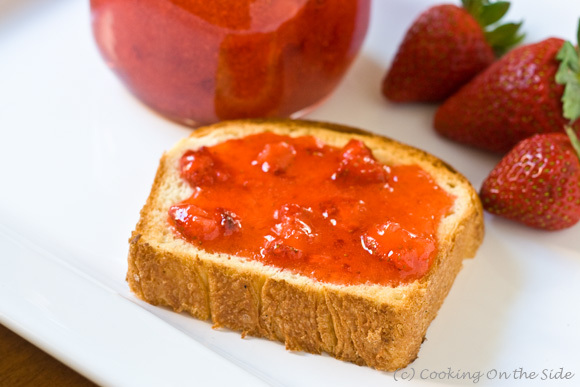 I love strawberry jam on warm bread. But never thought of making it at home. .-= Lone Acorn´s last blog ..Food Ingredients Dictionary – Bulgur =-. .-= ABowlOfMush´s last blog ..Butter Pecan Bundts =-. I took a canning class last year. It’s so easy and yet so rewarding. Gorgeous jam! .-= Esi´s last blog ..Chaya Brasserie =-. Excellent,thank you for sharing. I love the fact that the fruit is fresh in this method. .-= Savory Tv´s last blog ..Eggs 3 Ways With Julia Child, a Vintage Chef Video =-.